Frenzy-Designs.com does not require buyers to register before they use the Site. However, during the course of the registration process, Frenzy-Designs.com collects personal identification information and other user data. Members provide personal identification information such as legal name, company name, address, telephone number, fax-number, e-mail address and a user created ID and password. In addition, Frenzy-Designs.com may collect billing account information, which includes billing related contact information. Members participating on the Site by way of buying or selling products, Frenzy-Designs.com may collect this information and associate it with personal identification information to construct personalized user pages detailing a user’s transaction activity. We collect this information in order to communicate with the Member and to bill the Member for services rendered and/or items purchased from the Site. Other unique identifiers are collected to verify the identity of a Member or its Designated Employee, and to create account numbers in our record system. All personal identification information will be used solely for Frenzy-Designs.com internal purposes. This information may also be used to notify buyers and sellers of Frenzy-Designs.com promotions. We may use aggregated information in the form of statistics for marketing, or other purposes, but that information would not include personal identifying information. Frenzy-Designs.com considers all information collected on the Site to be a business asset. In the event that Frenzy-Designs.com or substantially all of its assets are acquired, such information will be one of the transferred business assets. Frenzy-Designs.com may also release personal identification information, billing account information, or any other user information when appropriate to comply with the law; or to protect the rights, property, or safety of Frenzy-Designs.com, its registered users, or other third parties. Users of the site will occasionally receive information on products, services, special deals, and a newsletter. Out of respect for the privacy of our users we present the option to not receive these types of communications. 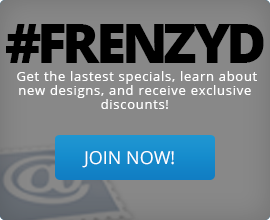 If you do not wish to receive future emails, send an email to support@Frenzy-Designs.com. Protecting your information is important to us. To that end, we have implemented Secure Sockets Layer (“SSL”) encryption software on the Website, which allows 256-bit encryption of all credit card data transactions. Frenzy-Designs.com also relies on a Member Name and Password system for added security. When using this Website, you may be using a third party website operated by one of Frenzy-Designs.com’s business partners, suppliers or advertisers. Please be aware that this privacy statement governs only Frenzy-Designs.com’s use of the information that you provide to us. If you disclose, or consent to the disclosure of personal information to a business partner or third party, you will be subject to that entity’s privacy policies and practices. The Company is not responsible for the information practices of such business partners or third parties.